This it a picture of it. Historic City Tour meets behind the small building to the right. Inside is a treasure trove of maps and brochures. 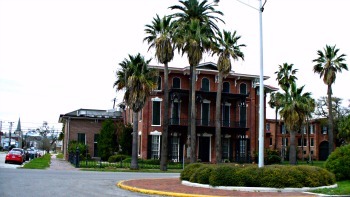 This is Galveston’s visitor’s center. Videos playing are filled with colorful local information. New brochures arrive unannounced. The other day I got a new one. It covers all the wood sculptors. 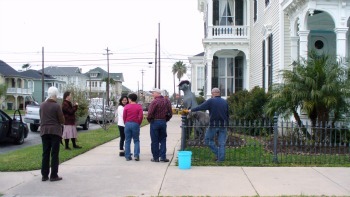 Historic City Tour is a small party tour. The day I want we had a golf cart. It held seven to eight people. It’s $15.00. It is subject to weather. Overbooking can be a problem. 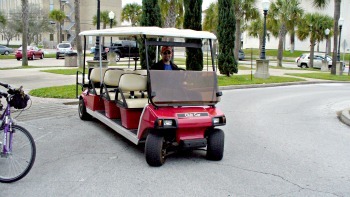 Call ahead; ask if the big electric cart is operating. If it is you’ve a better chance to go. Ask the operator if he will take your names. Then arrive early. It is a nice tour. I hope it gets sorted out. The tour is perky and fun. The open cart adds to it. Before you know it lively talk springs up. Home towns discussed- How long you in town for? - We just missed the snow storm- and on it want. It’s good fun. How did I ever miss that? It felt so good to be outside. Everyone was enjoying the scenery. The guide is a font of information. Pointing out nuances her and there. I think he is a history major. You get a great view from the cart. Cruising slowly you savor the sights. Our guide pointed out things I passed a hundred times. And never saw. On a Historic City Tour there’s always something new. Like a monument you passed for years. Or what you thought was a monument. It turns out to be an amazing fountain. My favorite is the sudden appearance of a house. One that was never there before! How does that happen? Ha, you have to love it! Touring neighborhoods is always a blast. Home owners are happy to see you. They wave. They cheerfully talk about their home. Proud you want a picture of it. Can you see the big dog sculpture in the picture? 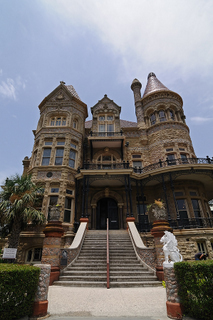 You’ll see homes of the movers and shakers of Galveston society. You’ll pass the ruins of Jean Lafitte’s fortress home. The tour goes where most tours go. But it covers a smaller area. It gets to the important locations; East end, the Strand and Post Office Street. And it does it at an enjoyable pace. It's another world and hard to leave! While in the Strand a ship had just docked. The streets were filled with sight seers. It’s like touring a museum alive with people. Sometimes dogs go strutting down the street. Looking like they own the place. It all seems another time and place. I just love being here! 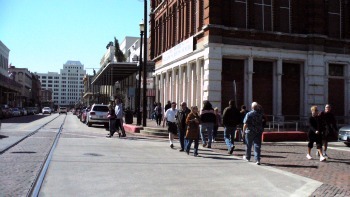 Leave Historic City Tours and return to Galveston Travel and Charm Homepage.